1 Rinse the octopus under cold, running water and place in pot dripping wet (you don’t want to dry it off – this is the moisture it will cook in). 2 Add the red wine, garlic, onion, bay leaf and cinnamon and cover the pot. 3 Bring to the boil over low heat. 4 It is tender when pierced easily with a fork (this can vary from octopus to octopus, so time is not a good indicator of doneness in this case). 5 Remove the octopus and let cool until cool enough to handle and cut into bite-size pieces. 6 Meanwhile, in pot you have cooked the octopus in, add tomatoes and olive oil. Boil for 8-10 minutes to bind the sauce. 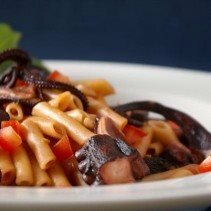 7 Stir in the cut octopus and nearly-cooked macaroni and simmer for the remaining 3-4 minutes required to cook your macaroni (if mixture appears too dry, add some of the pasta cooking water – you want this quite ‘moist’ but not soupy). 8 Stir in butter. Remove bay leaf and cinnamon stick.